In this out-of-this-world new DVD, preschoolers join Peppa, her little brother George, Mummy Pig, Daddy Pig, and all their friends for a “galaxy” of fun! When it’s nighttime and the sky is full of shining stars, Daddy Pig teaches Peppa and George how to find the North Star. Then, Peppa and her family are off on an exciting boat trip down the river. And when Peppa goes to a sleepover with all her friends, they’re too excited to go to sleep. Peppa Pig is such a great show. My children just love everything about them, from their cute British accents to the way they fall over and laugh at the end of each episode. One of their favorite things is when they jump in muddy puddles. This show is great because it's a realistic depiction of family life, just in animal form. The different species of animals represent the diversity of people and shows just how easy it can be for all of us to get along. This DVD set includes twelve of our favorite episodes. Anyone who has seen the show will know this a great selection, especially for kids getting ready for spring. The titles pretty much speak for themselves in regards to what each one is about. All these shows make for hours of fun. 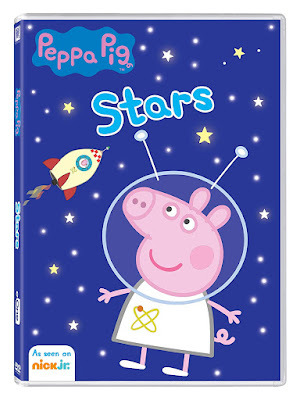 Anyone who is a fan of Peppa should have this DVD in their collection.